Years ago I managed the regional multi-state Medicare business for a large, well known insurer. Even then I would hear stories about a person aging into Medicare who had talked to a friend who worked with a guy that knew an expert who told them that Medicare paid for long-term care. Even today it’s not unusual for clients to tell me that they don’t need long-term care insurance because they are covered by Medicare. There remains more than a bit of confusion around this issue. Many people mistakenly think that Medicare will pay for their future long-term care needs. That’s probably because prior to 1998 it did. But when the Balanced Budget Act was passed in 1997 the rules changed. Today, Medicare coverage for long-term care services is very limited. While Medicare does pay for some custodial care, it should not be considered a funding source for long-term care expenses. Medicare is the federal health care insurance program for people age 65 and older or those younger who are totally disabled. It was created in 1965 under the Social Security Act. Medicare was designed to address curative or rehabilitative care needs. In other words, short-term care that helps us recover or recoup. It was never intended to pay for long-term care which is custodial in design. Custodial care or long-term care provides assistance with activities of daily living like bathing and dressing. By definition it is care that will be needed for at least 90 days or longer. Long-term care also provides supervision for those with cognitive impairment which includes numerous forms of dementia including Alzheimer’s. Medicare Part B is considered medical insurance and covers medically necessary services like doctors’ fees, lab services and outpatient care. Part B also helps cover some preventive services to help maintain health. This is a voluntary program with premiums, deductibles and co-pays. Usually the Part B monthly premium is deducted from the insured’s Social Security check. entering the facility within 30 days of being hospitalized and for the same reason as the hospitalization. The Medicare beneficiary must be admitted to the hospital. “Held for observation” doesn’t trigger Medicare coverage for long-term care. A Medicare supplement policy, also known as a Medigap plan, is private insurance that helps pay for some of the gaps in Medicare coverage. 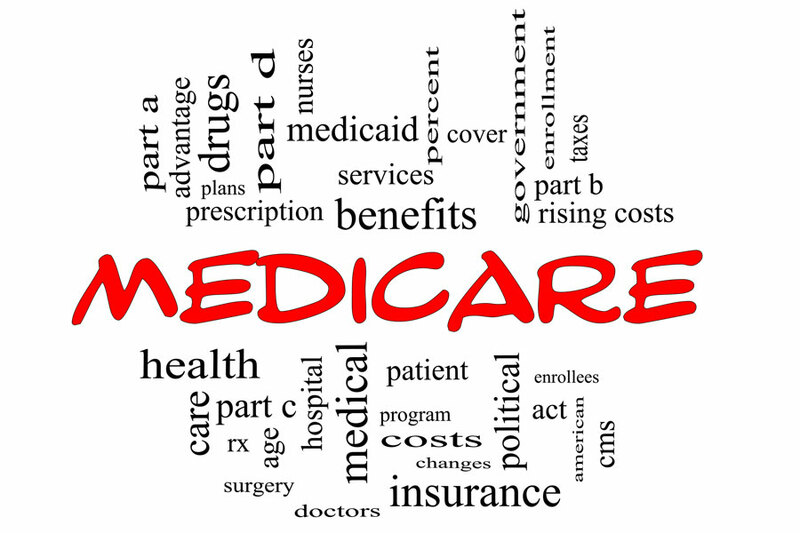 Depending on the defined coverage of a specific Medigap policy it may pick up costs not paid by Medicare but the costs must be for a service defined by the Centers for Medicare and Medicaid Services (CMS), the government agency that manages Medicare and Medicaid programs. Medigap plans are standardized by the CMS. For example, every insurance carrier that offers Plan G must provide the specific minimum coverage defined by CMS. The primary difference in Medigap plans is the pricing by private companies. According to a 2015 Congressional Research Service report, Medicaid continues to be the primary funder of long-term care expense picking up 43% of the expense. Medicaid is a federal program for low-income, financially needy people. It is set up by the federal government and administered differently in each state. Medicare covers an additional 22% of long-term care expense. Medicare is the federal program that provides hospital and medical insurance to people aged 65 or older and to certain ill or disabled people. Another 7% comes from other public funding programs such as Veterans Health Administration and Bureau of Indian Affairs. Together these government programs fund 72% of care. 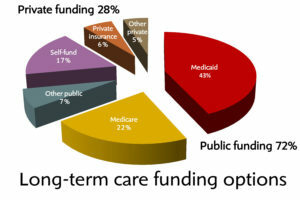 Private funding accounts for 28% of long-term care expenses with 17% paid from income and saving, 6% from private insurance and 5% from private sources including philanthropic foundations and corporations.